PORTLAND ARCHITECT CALEB JOHNSON is pushing the boundaries of vernacular architecture by using wood in modern ways. 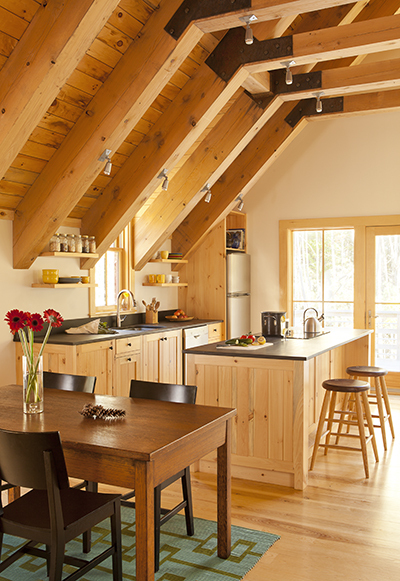 His forms are clean, his craftsmanship is high, and his materials run heavily to wood grown in Maine. A signature element is the use of plain cedar siding woven together at the corners for weather tightness. He spoke recently with Lee Burnett about his design influences, his feelings for wood, and the challenges of sourcing wood locally. The interview has been edited for length and clarity. Lee Burnett: Wood is quaint, rustic, old fashioned, am I right? Caleb Johnson: None of those. It has nothing to do with nostalgia… Wood is wood. Let it be wood. We don’t try to bend it into what it is not. We don’t try to shape it into looking like what it is not. We like to accept the properties of wood. That once it was a tree with directional grain and varying degrees of hardness, softness, structural strength and, important to our work, its weathering capacity. LB: Do you use pine for exterior trim? CJ: No, why would I do that? That’s just a bad idea. We use eastern white cedar. Why would I use anything else? We use eastern white cedar all day long. You can get it right here in Maine. You can’t get it in big dimensions and you have to wait for it. Occasionally, we use it structurally. LB: But a lot of old houses in Maine have exterior pine trim, right? CJ: You and I know that old growth pine versus the new growth pine that we buy is an entirely different product. It’s not the same stuff, the growth rings are farther apart, it’s not as dense. Using pine on the outside, I’m fine with it, but you’re asking for a maintenance headache. LB: So you don’t treat it? CJ: No. Sometimes we stain it, but if you leave it to us, we don’t. CJ: Oh, that’s ridiculous. You and I know, Maine has more wood now than it had in the 19th century. Maine was like almost entirely cut during the industrial revolution. We are probably cutting less than we have in the past and we’re probably cutting less than grows. LB: Talk about the challenges—time, cost, logistics—of sourcing locally, small mills at a distance. CJ: You have to be committed to it, right? It’s harder. It takes more phone calls, more waiting, more thinking, than calling up your local lumber yard and telling them to, you know, drop off for me 600 feet of one by four, pre-painted. That’s a call a typical contractor makes. LB: Count the number of architects you know that share your philosophy about local materials. CJ: I thought all of them, but maybe not. There are all sorts of designers. For me, I’m pretty emotionally attached to the materials we build our buildings out of, and when it’s wrong, I feel it. To say a material is wrong IS a big statement, so I can say it’s wrong for me. I feel it. When I build with local materials, it’s just right. And it’s right for a whole lot of reasons. LB: Have you had good influences, bad influences in how you developed this feeling about wood? CJ: It’s a truth I’ve always felt since I was a little kid… My parents were going to build a modular home. They said they were going to put vinyl siding on it. It was the most offensive, angering moment in my eighth-grade year because it was wrong. And I knew it was wrong. So, I know I’ve felt this way about materials for a long time… Louis Kahn, above all architects, has an intimate connection with the materials he built with… Another is Brian McKay-Lyons. He pushes the boundaries of traditional architecture but works with traditional craftsmanship materials. LB: What is the feel that wood gives you? CJ: You can touch it and it’s warm. You can see how it grows, how sap moves through it to feed its structure and leaves… It’s beautiful to look at. It has an interesting texture to touch. Wood gets better with age. It has a patina and it wears. An antique table that shows hundreds of years of wear and use is more valuable than a brand new one from Pottery Barn… Wood has this quality of becoming more beautiful, more valuable to humans as it ages if it is well protected and maintained. LB: When you were first trying to source cedar, how much of a logistical challenge was it? CJ: It was a really big challenge because I had this idea that… I didn’t want paint on it, right? My first projects, no one would listen to me. So, then I built this house for my family and I could do exactly what I wanted to do… My idea was to just use cedar, which would naturally weather, which it’s been doing for the past ten years. And it’s fine. I would put it on a rain screen and weave the edges, instead of miter them or have a corner board. So, I would make this really nice, clean look. But nobody sells eastern white cedar one by six. So, actually it was a challenge. I called around. Nobody had it, nobody wanted to do it and everyone told me it was a bad idea. So now I’ve built I don’t know how many buildings with a nice clean, modern look. LB: What do you say to a client who loves wood but they like teak, tropical hardwoods, bamboo? CJ: Just doesn’t happen. I put bamboo in a couple of projects and regretted it. Looks terrible. It was a trend. LB: What are some ideas for using wood that you haven’t tried yet? CJ: I want to execute this: a one hundred percent Maine wall. And if you get me some Maine wood [rigid foam] insulation, that would be sweet. That would be a Maine wall through and through. For no other reason than just fun, but intuitively that wall is going to be here a lot longer than if I put a piece of plastic in that wall.